Although the U.S. Forest Service was created back in 1905, it wasn’t until World War II that the need to raise public awareness about the dangers of wildfires arose. At the time, most able-bodied men were already drafted into the military service and there was almost no one to fight forest fires. The Forest Service began using posers to educate people about the dangers of wildfires, hoping that this would prevent them from starting in the first place. Initially, Walt Disney allowed his character Bambi to appear in the Forest Service’s public service campaigns. However, Disney only loaned his character to the U.S. government for a year. After much discussion, a bear was chosen as the new symbol. He was named after Joe “Smokey” Martin, an FDNY firefighter who suffered severe burns and lost his eyesight during a 1922 rescue. 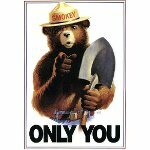 The first poster featuring Smokey was released on August 9, 1944, which is considered Smokey Bear’s birthday. In addition, the town of Capitan, New Mexico celebrates the Smokey Bear Days on the first weekend of May.